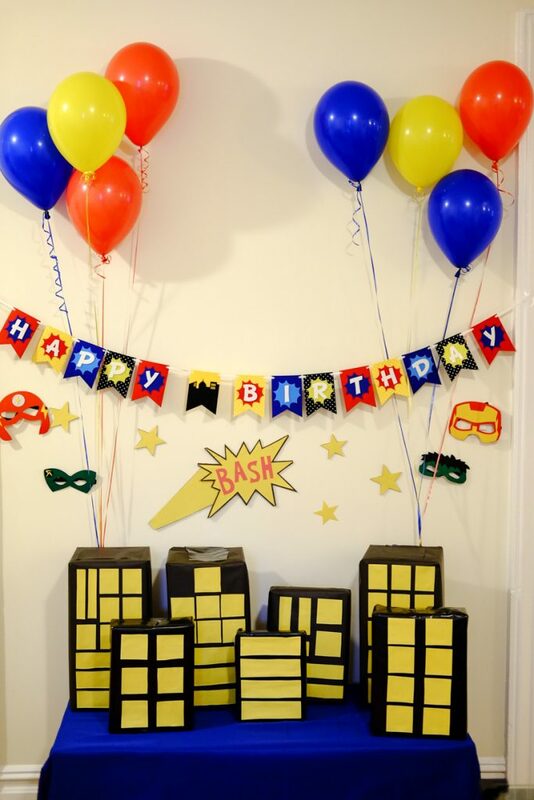 Bash's 3rd Birthday: A Superhero Bash - Bash & Co. The saying, “they grow up so fast”, couldn’t be more true! 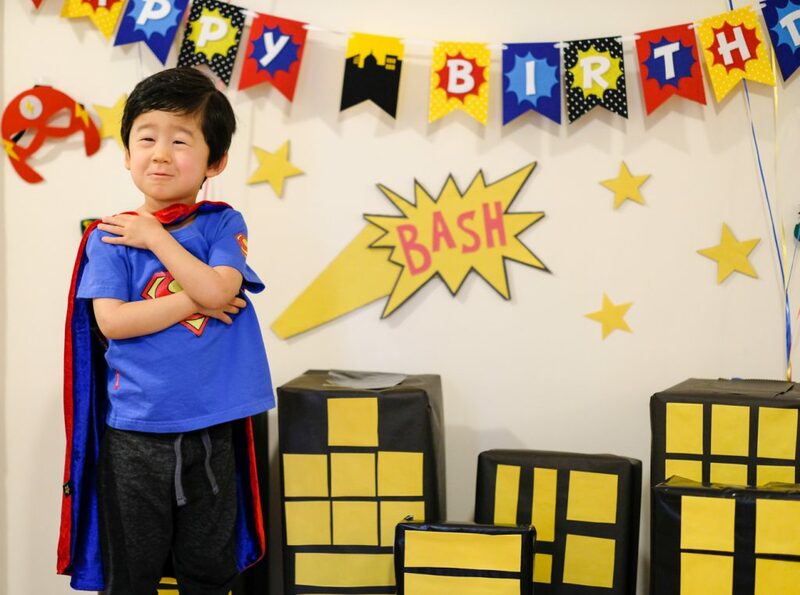 This week, we celebrated Bash’s third birthday and I can’t believe how the past three years have truly flown by and what a little (super)man Bash has become. I’m fascinated by his imagination and inventiveness and I’m definitely soaking in all of the love, cuddles, and family snuggles, as I know those won’t last for too long. 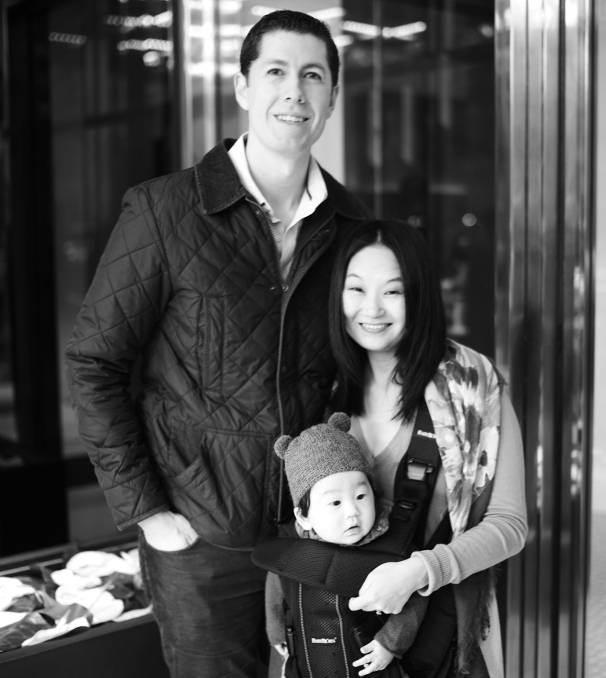 For Bash’s third birthday, we had a small, at-home family celebration. Initially, we were planning a big kids’ party as Bash had expressed he wanted a “superhero pizza” party. However, I guess I got started party planning too late as my January calls to various venues were met with mid-March availability at the earliest! Note to self and fellow NYC moms: apparently, there’s a secret NYC birthday code where booking venues must be done at least 8 – 10 weeks in advance and invitations go out 4 – 6 weeks in advance (or so my more experienced mom friends tell me). Mid-March seemed a little too close to baby sister’s due date and everyone told us that kids don’t really start remembering their birthdays until 4 anyways. So, we finally decided upon a small but festive family party, a mini celebration at school, and Disneyworld later this summer. Balloons: we filled our hallway and dining room with balloons, so as soon as Bash walked out of his room on his birthday morning, he was thrilled with the surprise! Pro tip: ask for “hi-flo” fill, which lasts much longer than standard helium (18 hours). It’s definitely worth the extra money if you don’t want your place looking like a sad balloon graveyard the next day, because, let’s be honest, a 3 year old’s birthday isn’t just a one-day event. We won’t be able to get rid of these balloons for at least a week. 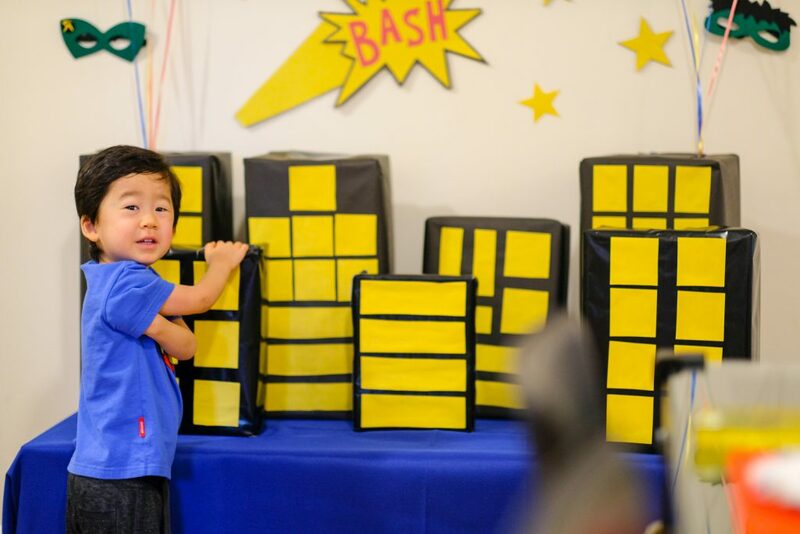 Backdrop: I wrapped his presents as buildings using black wrapping / kraft paper and construction paper and made some comic-book style cutouts for the wall using cardboard and construction paper. 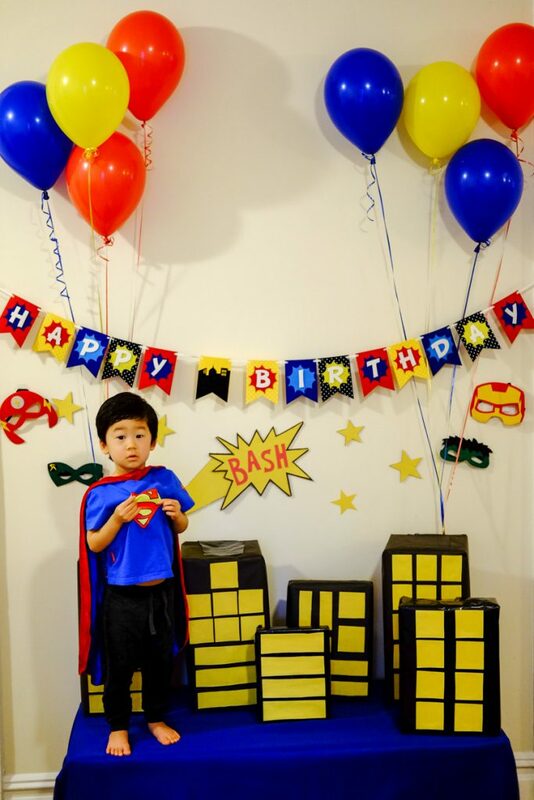 I also found this really cute felt superhero Happy Birthday banner by Decomod – way more sturdy than a paper / plastic sign and very well made. 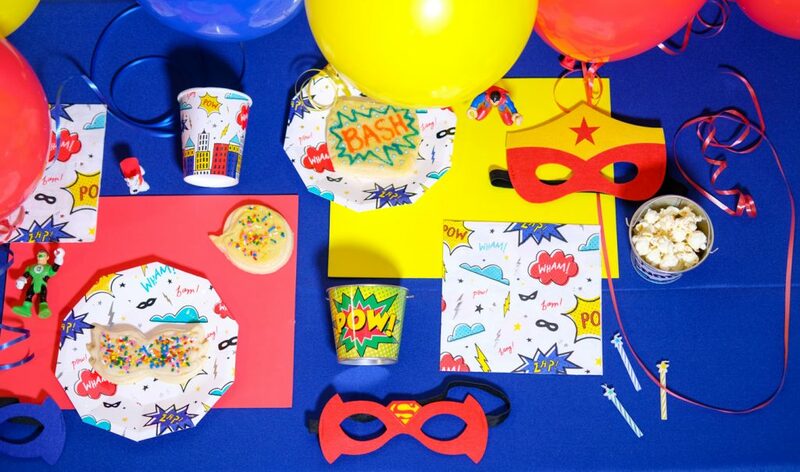 Tablescape: I couldn’t resist these cool superhero comic book style party supplies from Daydream Society. I also used these foam sheets as placemats. 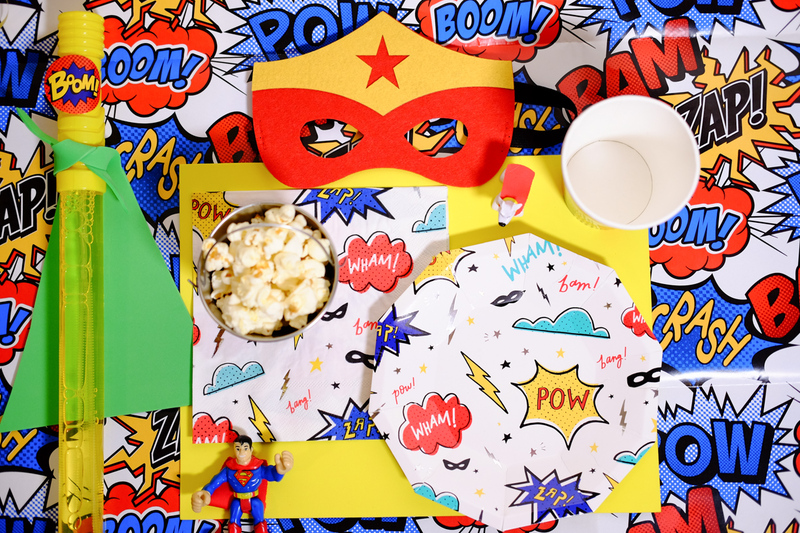 And these cute comic buckets make for great popcorn snack holders or for favors. 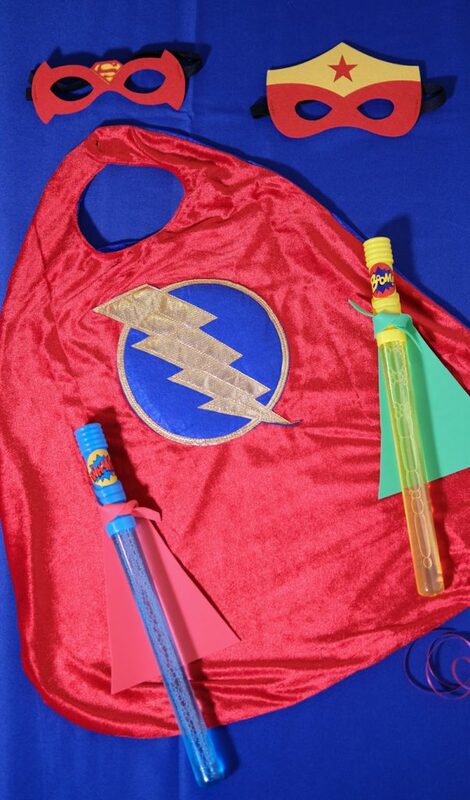 Favors: For Bash’s classmates at school, I thought it would be fun to engage them in the theme with these felt masks and bubble wands which I DIY’d into superhero wands using stickers and cutouts from those extra foam sheets. Desserts: While in the past two birthday parties, we ordered great cakes from Magnolia Bakery (standard in-house designs) and Alice’s Tea Cup (custom designs), this year, I decided to try my hand at baking a special dairy-free cake that Bash could actually eat (he has a severe dairy allergy). We looked at a few “vegan” bakeries, but they even stated they used eggs as they haven’t found a suitable replacement to compensate for taste. So, I tried this vegan vanilla sponge cake (I had to add an extra 1/4 – 1/2 cup of flour to this recipe) and this vegan vanilla frosting. For the filling, I used blueberry jam and then topped the cake with fresh berries. (Oh, don’t worry, I baked a bunch of sugar cookies so I have my supply for the week. Next time though, I’ll leave the icing decorating to the pros – it’s a lot harder than it looks and those gel icing writers are pretty bad). I loved seeing the look of joy and thrill when Bash walked out of his room to balloons covering our entire dining room and building-wrapped presents lining the walls. To be honest, I was almost more taken with Nick’s excitement. It was so endearing to see how excited Nick was to surprise Bash, especially since Nick’s not the theme party type. He even bought matching dad / son Superman shirts and was the one to wake up early that morning to make sure everything was in position and his matching SuperDad costume looked good. (I was sleeping in and still pajama clad for Bash’s “first look” at his superhero party). Bash had a great birthday and still wakes up each morning and nap asking if it’s his birthday! What do you typically do for your kids’ birthdays? 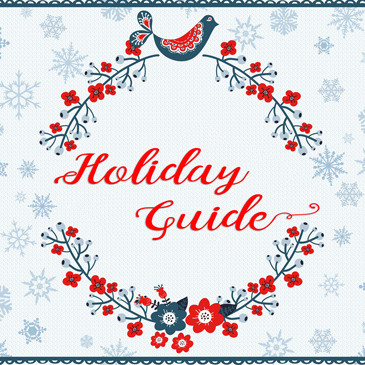 Do you go all-out each year or focus on the “milestone” birthdays? For more party ideas, check out our Pinterest boards and some of my favorite party inspiration sites: Kara’s Party Ideas and 100 Layer Cakelet.